The Construction area include constructing large civil-engineering infrastructure and buildings. 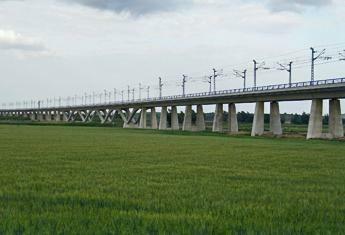 Builds all kinds of infrastructure for motorways, toll roads and high-speed railway lines. Constructs building for government, health and cultural purposes, as well as social housing projects. Isolux Corsán has built up strategic expertise in infrastructure projects for the water industry. Its work reflects a deep commitment to efficient, responsible management of the entire water cycle. Construction and facilities at great depth. The careful refurbishment of the Leal Theatre proves Isolux Corsán's expertise in refurbishing emblematic and historic buildings. Isolux Corsán builds an alternative route for 5 million people. Isolux Corsán builds the eighth section of the new Basque "Y". The tram has a daily capacity of 90,000 passengers. The bridge, which is the longest in Peru with 563 meters, consist of six lanes and 40 metre pillars. Isolux Corsán has built the railway hub of the Trinidad-Montcada line (Barcelona), part of the high speed line between Madrid, Zaragoza, Barcelona and the French border. The actions undertaken by Isolux Corsán in the desalination plant project in Moncófar (Castellón) include the design, implementation and operation and maintenance of the plant for a period of three years.